The present carrara marble altar in St Michael’s Church, Kildysart was first erected during March 1914 in the Chapel of the Presentation Convent, Tuam, Co Galway. A plaque attached to the altar recalls that the first Mass was celebrated on the altar by Most Revd Dr Healy, Archbishop of Tuam on Holy Thursday (9 April) 1914. The altar features a depiction of the Agony in the Garden. In November 1991 Fr Michael Hillary, PP Kildysart on behalf of the parish, acquired this altar together with the matching tabernacle, ambo and chair. The total cost was £1,100 (€1,397). Michael Haugh and Michael Corry re-assembled and erected the altar and other items in the sanctuary of Kildysart Church during January 1992. Previously, an altar of Caen stone was erected in St Michael’s Church and was consecrated by Bishop James Ryan in 1877. One the occasion of the consecration the sermon was preached by the distinguished Dominican Fr Slattery and the proceeds were used to defray the parish debt. This altar, in turn, was replaced during the renovation of the Church in 1973. Shared Anniversary Mass (May) 11am 18 May, 2014. The theme of this years Trócaire Lenten campaign is ‘Let Justice flow like a river’ (Amos 5:24) and the focus is on ‘Water’. In the African countries where Trócaire works 51% of people do not have access to clean water. The Trócaire box and poster this year features Enestina, a nine year old girl from Malawi. Until Trócaire worked with her community to develop a borehole, Enestina had to carry 15 litres of water twice a day a distance of 1 KM for her family. During the dry season the queue to get waters can take hours. As a result she frequently missed school or arrived there feeling tired. Trócaire boxes will be available in our Church next weekend. You are welcome to take one for your home and/or place of work and use it during Lent. The people of Kildysart have been extremely generous in the past in support of the work of Trócaire. 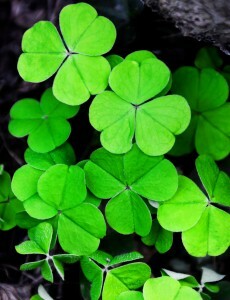 The feast of our national patron, St Patrick will be celebrated on Monday, 17th March. It is a Holy Day of obligation and we will have Mass on Monday in St Benedict’s Church, Coolmeen at 9.45am, in St Michael’s Church, Kildysart at 11am and in St Mary’s Church, Cranny at 6.45pm. Pilgrims who are sick or who need assistance are most welcome and are cared for in the Accueil Notre Dame, close to the Grotto with our own Medical and Nursing team. Special medical forms must be completed for this section of the pilgrimage and can be obtained from Fr Tom Ryan Pilgrimage Director SS. 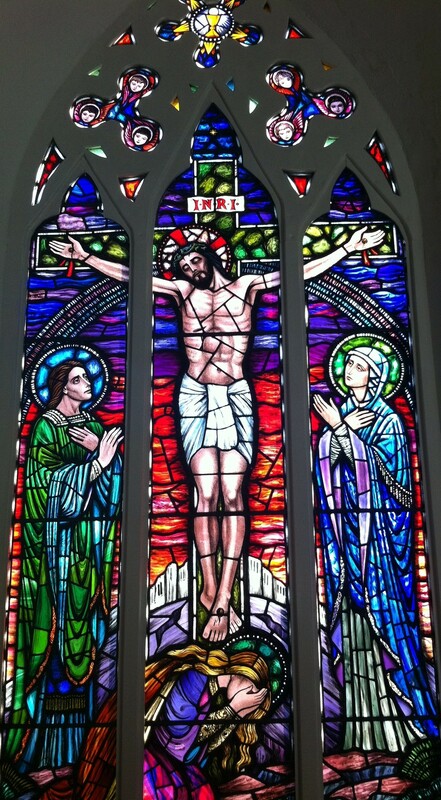 John & Paul Presbytery Shannon Co Clare Tel : (061) 364133. The cost for a sick or assisted pilgrim is only €565. The second pilgrimage from the Diocese takes place in the autumn, for five days this year from Tuesday 7th October to Sunday the 12thOctober. 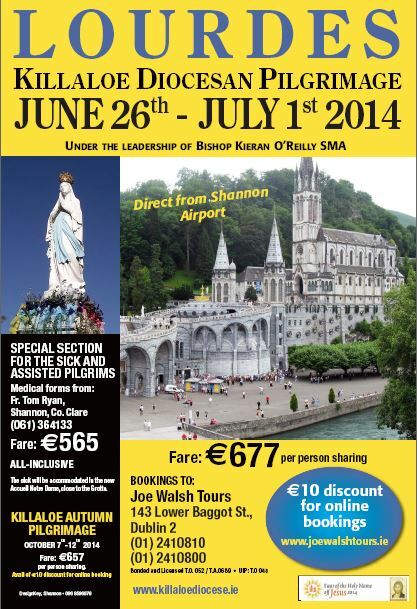 The all-inclusive cost of this pilgrimage is €657 with a €10 discount for online bookings. For enquires please contact Fr Tom Ryan.